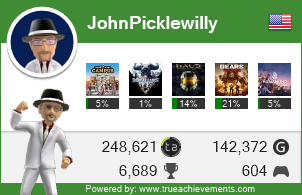 Specifically looking to work on the Liars Dice and Poker achievements but would be willing to help with anything. I think we need 6 people for this one so if you are interested let me know and I'll set a date / time to work on this. Those ones require DLC, yes? @techjedi wrote: Those ones require DLC, yes? Yep... did you get the season pass? Nope, and it's not actually a season pass that they offer. There's an "Undead Nightmare Collection" pack for $20, which just bundles all the separate DLC packs into one buyable unit (and saves you $10). @techjedi wrote: Nope, and it's not actually a season pass that they offer. There's an "Undead Nightmare Collection" pack for $20, which just bundles all the separate DLC packs into one buyable unit (and saves you $10). Oh, that's right. It's been awhile since I played it but you're right. I was thinking you bought the bundle but it was Gears 3 when it was on sale. I'd have to say that the bundle is a lot of fun but personally I'd probably wait until it got to 10 bucks or so. Or you know... that bargain wheelhouse price of "less than $10, preferably closer or less than $5... do you do free?" There is a chance I'm going to order a refurbished Xbox 360 and one of the bundles comes with the Red Dead Game of the Year. If I get that bundle, it's yours. I'd be up to a session or two of RDR. I don't want to commit to another weekly session, but I can go for a couple sessions. I'll be in for this I think I only have one achievement in the game that I did for a bean dive in one of the last 3 years. Be a great reason to start the game lol. This might be an issue I don't have a mic for my 360 so unless they make it backwards compatible in the next few days I'll be unable to communicate or I guess I could invest in a cheap headset for the 360. I wouldn't be surprised if RDR ends up backwards compatible eventually, but something tells me (since it was leaked briefly and then removed) that RockStar is intentionally squashing it's release -- probably because they are in the midst of developing RDR2 for Xbox One or something. Well, you know the secret to success is to surround the cattle and have everyone whistle at the same time while riding in erratic circles. This in NO WAY confuses the programmed behavior of the digital cattle, and it most certainly DOES NOT cause them to spread out and walk aimlessly towards their would-be killers. After all, I mean we should already know that cattle herding is a war of attrition and at BEST one should expect to only make it to the ranch with about 5 of the original 20 cows. I'm hoping more of us have gotten this downloaded because I'd love to set up a session on Monday nights once we're either sick of Gears 2 or have completed the Annex cheevo. I hit up the DLC freebies, so I have that all squared away. I have not, however, pulled RDR down onto my Xbox One (and subsequent DLC). I sort of want to do that since the frame rate was improved. @techjedi wrote: I hit up the DLC freebies, so I have that all squared away. I have not, however, pulled RDR down onto my Xbox One (and subsequent DLC). I sort of want to do that since the frame rate was improved. Just goes to show you what I know... I wasn't aware the frame rate issue was improved. Might have to move this one over to my X1. I know I'm late to the game here, but I need 2 online required achievements that will need help with; admittedly I haven't played this in some time. We've taken a break from RDR but some of us still have achievements that need to be knocked off our list. RDR was such a great game I certainly wouldn't mind going back to help those that need it. @kbeau73 wrote: We've taken a break from RDR but some of us still have achievements that need to be knocked off our list. RDR was such a great game I certainly wouldn't mind going back to help those that need it. What he said! I still need a couple multiplayer achievements as well. I'm still whittling away at mp achievements on RDR currently & don't mind helping out. Send me a friend invite GT: Das Fura.